Simon has recently entered into Being Two with … more vigor. Most notably, at the dinner (and breakfast, and lunch) table. Simon’s always been a picky eater, but lately he’s added to that the idea that the best way to reject certain morsels — or even to announce to everyone that meal time is over, right now — is to throw his food on the floor. There is a certain sensibility to this, of course. Food down on the floor certainly isn’t going to be eaten by anybody, and throwing it down there conveys a sense of finality far greater than merely signing “all done” (especially since Simon’s “all done” is not infrequently followed up by his continuing to nosh; perhaps he thinks the sign merely indicates a pleasant fullness). So, failing all that, we’ve shifted tactics and are now attempting outright bribery. Again, like his Papa, Simon loves him a chocolate chip or thirty. So we’ve taken to offering him a few of them at the end of dinner, provided that his food stays off the floor. And, as is our wont, we have set this proposition to music. Simon frequently enjoys signing along, even if he infrequently enjoys fulfilling his part of the deal. 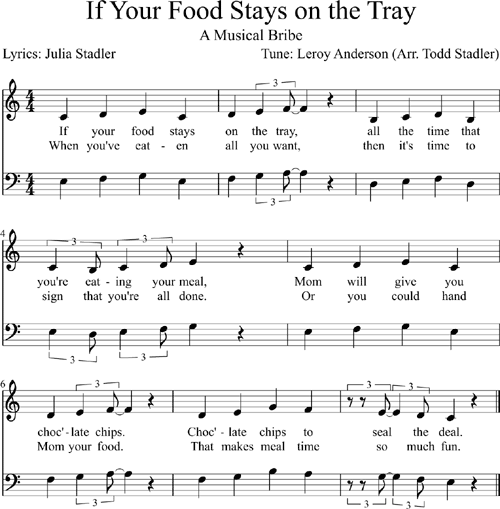 In the somewhat unlikely case anybody feels the need to use this music in their own family (or for their next hit single) it is also available as a PDF.